What kind of housewife wouldn’t want to transform the look of her room with the bright colors of blooming violets, begonias or geraniums? It is aesthetically pleasing, a little refreshing, and generally beautiful. But inevitably it is necessary to decide where to place these flowers in pots? Not on the floor. Looking for shelves. You cannot always find what you need in the store, and you want to save money. There is only one way out - to make oneself so that all this color aesthetics, as they say, is broken down. 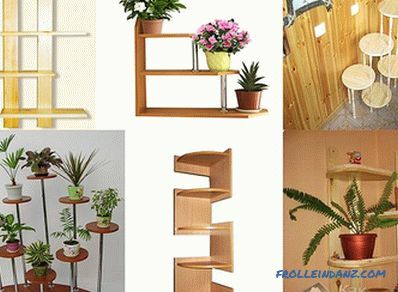 In this article we will explain how to make flower shelves with your own hands from wood and chipboard, consider the options for wall and floor shelves, and also show photos and video instructions. What material can the shelves be made of? This could be plywood, chipboard, wood, metal, glass, drywall, etc. 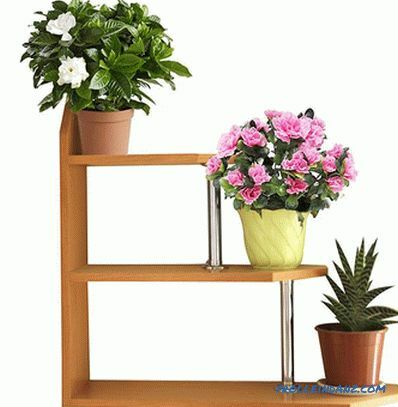 If you have wooden planks lying around on your farm and you haven’t found proper use of them, make a flower shelf made of wood. 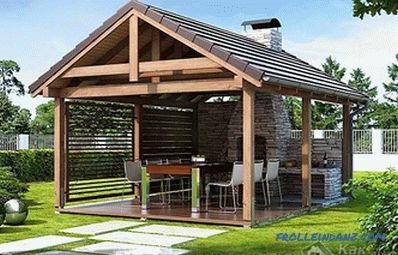 It will be very good , if these wooden planks you will have about 6 pieces, and not less than two meters in height and the size of the end 35 * 5 mm. Another will need two bars of 20 * 20 mm, 2 meters high too. Arm yourself with a pencil, screwdriver (cross-head) or screwdriver, tape measure, saw and jigsaw, as well as 25 and 40 mm self-tapping screws. Also, you can not do without an assistant, who will simply support the design when mounting shelves to the racks. Now you can start making. 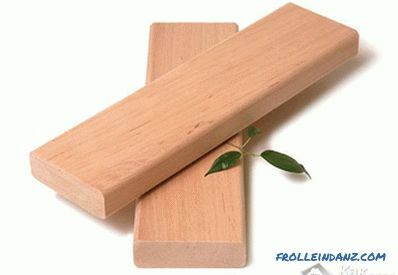 Wooden slats for the shelves are cut to 60 cm (12 pcs.) And 64 cm (6 pcs. ), And in general, we get 18 small slats - these are future shelves. Bars are cut by 70 cm and it turns out 4 pieces - it will be the side racks. From the remnants of the bars, we cut out six more small bars: four by 23 cm and two by 19 cm. This is the future fixture for shelves. On the bars that will serve as racks, we use pencils for the two lower shelves. The marking is done with the calculation of the height of the flowers themselves in the pots that we plan to place on them. With the help of four bars (23 cm) we make two shelves. At both ends of the slats, screws with 25 mm across fasten bars, which in turn connect the slats to each other. With 70 mm self-tapping screws, we fasten the shelves to the uprights. Using the same screws, to the upper parts of the rack between each pair of vertical posts we fix inside bars of 19 cm. 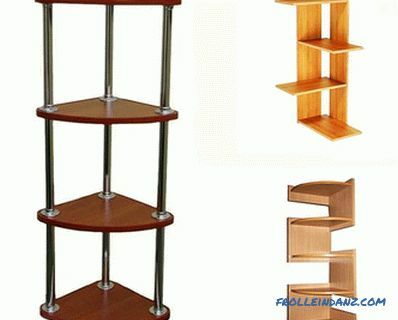 The third shelf is made locally by attaching each strip to the top of the product with 25 mm self-tapping screws. . 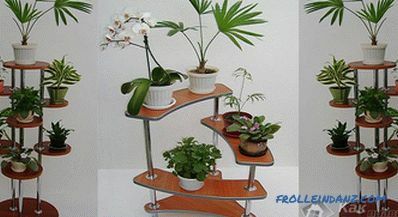 This is how a small floor shelf or a rack for flowers turned out. 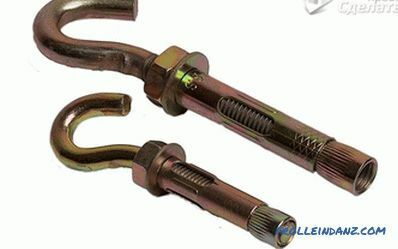 Fasteners (confirmatics, self-tapping screws - 2 pcs. Per 45 mm and 6 pieces per 16 mm). Drill for confirmats and regular drill. Device for pasting edge (ordinary bar with a groove slightly more than 16 mm). Wooden block wrapped in sandpaper. As you can see, the list is considerable, and all this is necessary to prepare for the assembly. First of all, we determine which ends of the parts will be visible, after which we begin to glue them over. We use for this the usual household iron and shoemaker knife for trimming the excess edge. 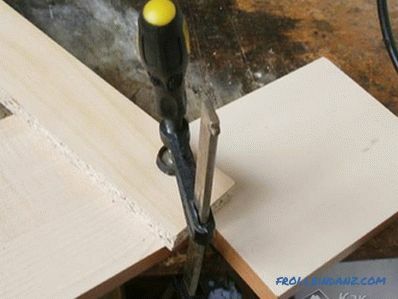 Using a special device, smoothly smooth the glued melamine edge and grind the end corners with an emery board. Those places that will dock with each other, do not need to paste over. Elements of the rear base for future shelves that we did not paste over with paper edge, prepare for docking with each other. We drill two shallow holes and pour glue into them. We hammer chopies (shkanty) into the holes, and in the joined part of the neighboring element we also drill two holes and fill them with glue. To match the choopyc with the holes of the adjacent element, use special "jigs" or furniture taps for dowels. 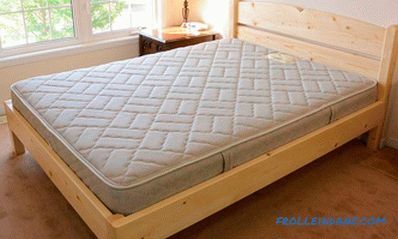 "Conductors" are worn on the dowels and pressed against the mating part, sharp taps will inevitably leave small grooves. Drill there. We connect the parts together and firmly press. For this, the clamp is an indispensable tool for us.Tightly clamp the clamp parts and leave to dry completely. The back of the shelves is made. Now our task is to secure the shelves. To do this, we first make markup for confirmats. Using a special confirmatous drill to drill holes, then proceed to the mounting of shelves, alternating them right and left. 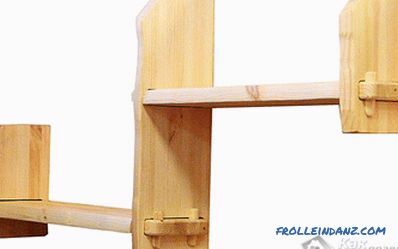 It is best to attach the hinged strips at the top and bottom so that the shelf hangs on the wall strictly vertically, even if someone accidentally touches it. It remains to arrange the flowers nicely and you can enjoy the work of your hands. You can dream up and make the shelves multi-colored. Or another option: round the free corners of the shelves and upholster them with a T-shaped plastic edge. It will be much more beautiful. Now the most time to talk about the corner shelves for flowers. 4 squares of chipboard, the size we need. T-shaped edge (possible according to the color of the product, although it is not so important). Chrome-plated tube Ø 25 mm (usually three meters on sale, so it would be better and cheaper to get some residues somewhere), 18 flanges for tubes. Milling cutter with a mill. 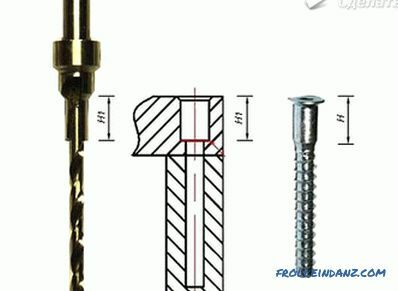 Wood screws (4 * 16) up to 70 pieces. 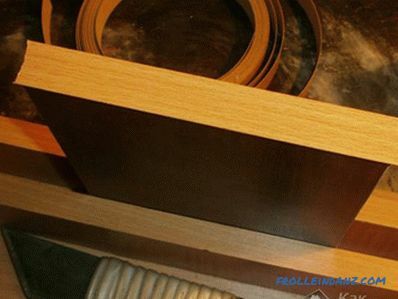 We preliminarily prepare the shelves, making them radius. We can do this with an electric jigsaw and a grinding machine. Jigsaw cut off the excess, and place the cut process with a grinder. It is worth noting that such a tool as a jigsaw, mercilessly cleaves laminate when cutting. After grinding, these chips are practically removed. The next stage is to glue even ends of the shelves with a melamine edge. Then we will deal with the radius of the future shelves. 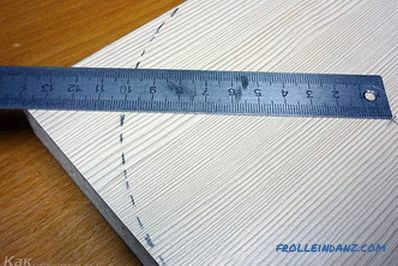 We will need a milling cutter and a milling cutter, which in the end of a chipboard sheet cuts through a small groove, where we subsequently need to hammer in the T-shaped profile with a rubber hammer. 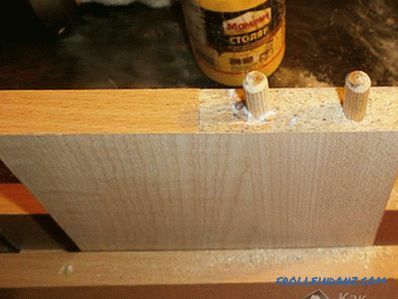 Next, make a basting marker and drill 3 holes in the chipboard under the 25th pipe. The holes in the upper and lower shelves are not drilled at all. With a special pipe cutter, we cut to size the parts of the chrome pipe that we need. To the bottom of the shelves in advance fasten legs. Then we screw the flanges on the openings of the two shelves on both sides (it is better to do this before installing the shelves in the product) and thread the tubes. We fix them with special screws on the flanges and, one can say, the whatnot is ready. This corner piece with flowers will be a wonderful decoration for your corner. 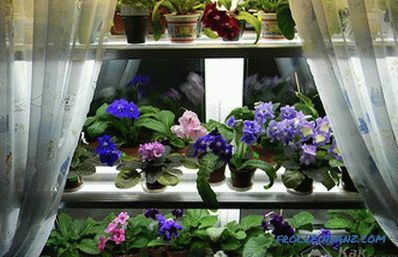 Now we should talk about light-loving plants that need to install closer to the window or even on the window. 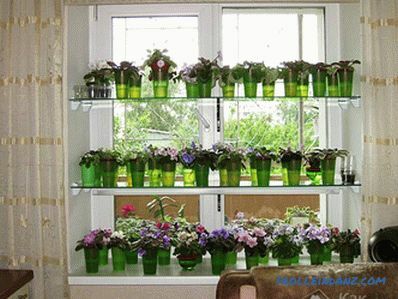 Naturally, we will not talk about flowers, but about window shelves for flowers. 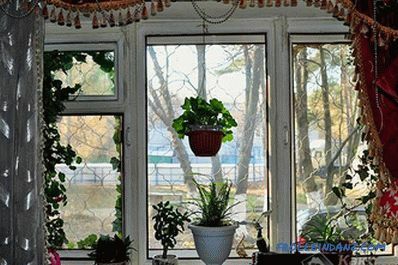 Of course, your desire to arrange flowers on the window can be caused not only by the light-loving nature of the plant, but also by the structure of the growth of its shoots. They can be, for example, drop down or curly. 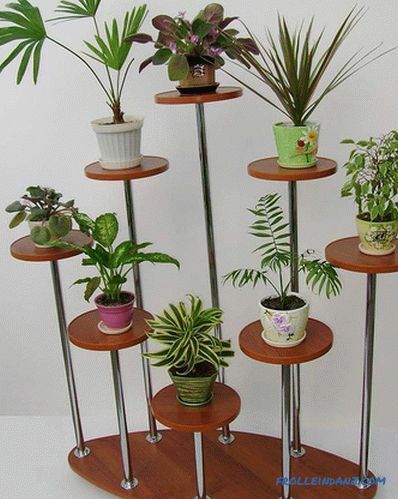 In this case, it would be better to think about how to arrange these flowers higher. 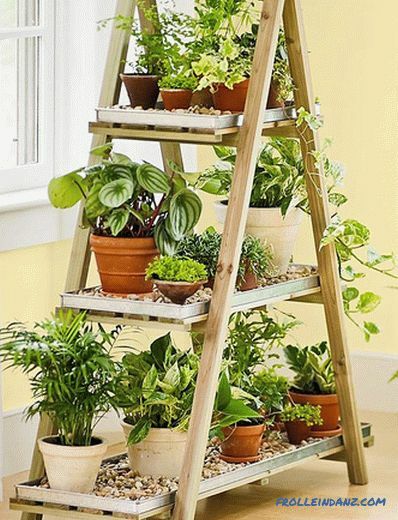 How to make a shelf for flowers in this case? For this you can use different materials. 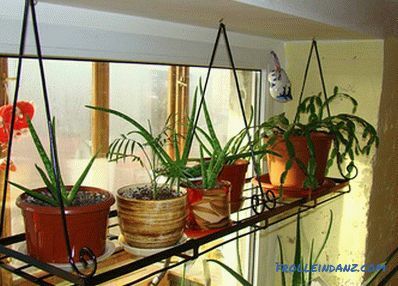 You can also make it so that the window will have suspended plants in pots. 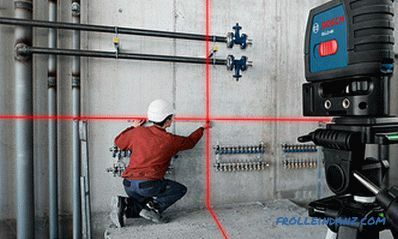 For this we need only a few anchor anchors with a hook of 8 * 60. Drill a hole in the upper part of the window. Insert the anchor hook and turn it clockwise until it stops. Tying ropes to pots. It is better if it is an ordinary fishing line. It is not so visible and durable enough. However, there is no limit for fantasy. The anchor mechanism is so designed that screwing in, the expansion part of it expands and, thus, is quite firmly seated in concrete. And if we talk about literal window shelves, then the next option is especially acceptable for those who want to do everything, firstly, quickly, secondly, reliably and, thirdly, beautifully. It is clear that we are not talking about placing flower pots on the windowsill. It is cumbersome, inconvenient, and in some cases not very beautiful. 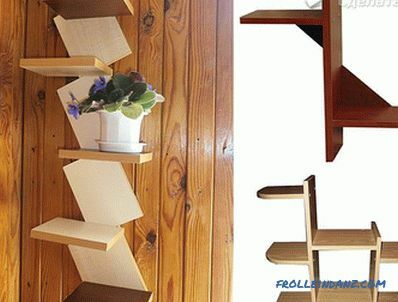 These shelves can be mounted provided the window itself is wooden. 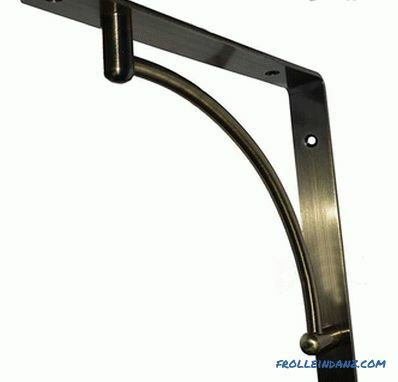 Arched bracket (concave) In any furniture store that sells furniture, you buy a chrome shelf bracket (called an arch bracket concave). 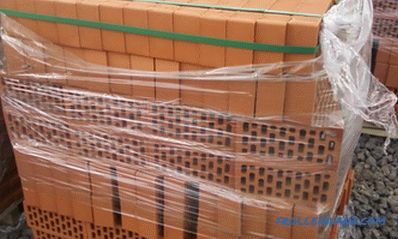 On the economic market, you can buy a 1.5-meter-high rack about 3.5 cm wide and about 1.5 cm thick. 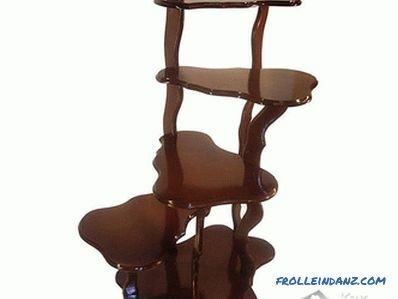 As a rule, there is a glass shop next to the market and if you know the exact dimensions of your future shelf, order 3 glass thickness along the way. mm with grinding in a circle. For beauty, you can choose any tint, and if you have children, it will be important that the glass is necessarily tempered. Such glasses, when dropped on the ground, scatter into small pieces with not sharp ends, and your child will not get hurt about them. Next, measure the depth of the shelf holder and cut small planochas by these dimensions. Bottom on small screws fasten these strips to the brackets. The tree in this case will serve us as the lining material between the glass and the iron. Just be sure to ensure that the screws do not come out on the other side. Therefore, you must be fasteners appropriate sizes. 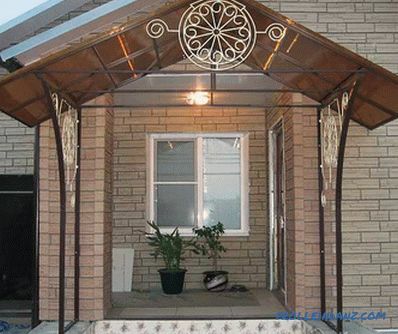 It remains the case for small: attach the brackets to the window frame. After that, you can put shelves on top and make sure that we did everything correctly and the plane is strictly horizontal (use the building level for this). 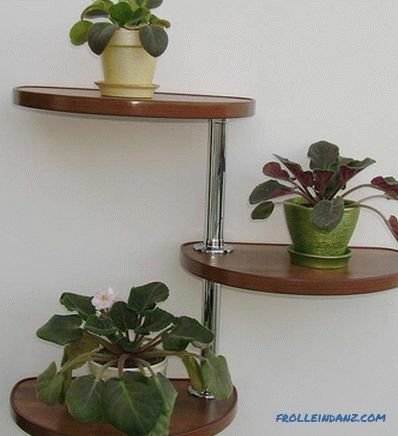 Shelves are not attached to brackets, but will be pressed against flower pots. Convenience is that all this glass construction can be easily dismantled in case of general cleaning, when windows need to be washed. As you noticed, there are quite a few variations on the shelf for flowers. Which one you prefer depends on your taste and your abilities. 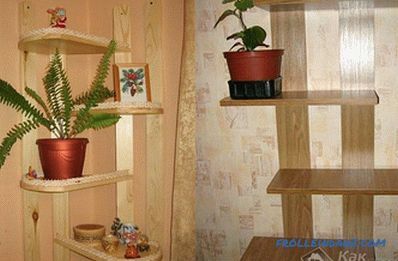 The main thing is different: beautiful flowers will decorate your house, and beautiful original shelves made with your own hands will tell a lot about the owner and owner of this house. Therefore, let there be many flowers in your house.